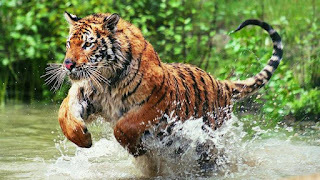 The Bengal tiger, or Royal Bengal tiger, roams a wide range of habitats including high altitudes, tropical and subtropical rainforests, mangroves, and grasslands. They are primarily found in parts of India, Nepal, Bhutan, Bangladesh and Myanmar. Male Bengal tigers measure 8 to 10 ft (2 to 3m) in length, and can weigh from 440-650 lb (200-300kg). Female Bengal tigers measure from around 8 to almost 9 ft (2.5 to 2.6 m) and weigh in around 220 to 400 lb (100 to 181 kg). All white tigers are a variation in color of the Bengal tiger, some tigers have been reported that are white with or without black stripes. Bengal tigers hunt medium and large-sized animals, such as wild boar, badgers, water buffaloes, deer goats and have been know to prey on small elephants and rhino calves. They are know for their power and in one incident a Bengal tiger was reported dragging away a dead gaur which 13 men were not able to move. As a gaur can weigh 1 ton or more, it would mean the tiger had to be able to drag something 5 times its own weight. Bengal tigers hunt mostly at night, killing their prey by severing the spinal cord, or by inflicting a suffocation bite (usually for larger prey). As with other species of tigers, habitat loss and poaching are key threats to the survival of the Bengal tiger. They are not only killed for their skin and for their body parts which are used to make traditional Asian medicines. What are the Top 10 Uses for Oregano Oil?